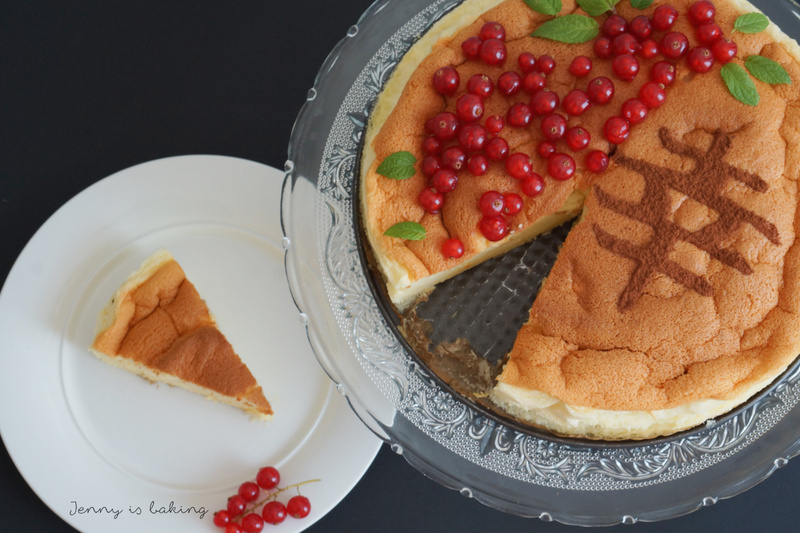 Japanese cheesecake. I have always wanted to try it. 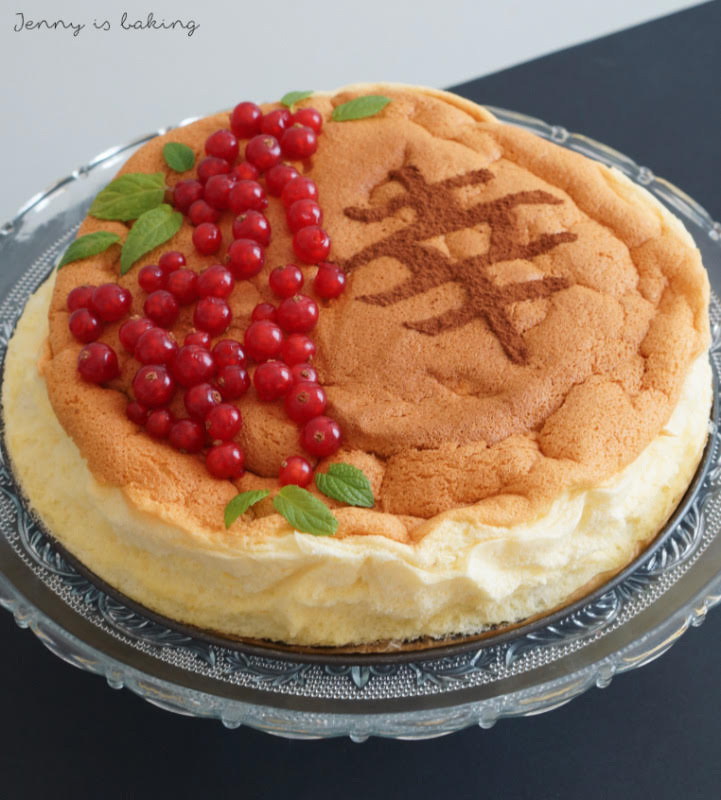 Japanese cheesecake is a very delicate matter. It has to be handled as careful as raw eggs. It does contain a lot of eggs. Maybe that’s why it is as light as a feather. No, this is not your typical American cream cheese cake. It is closer to an angel’s food cake than anything else. It has cream cheese, yes, but the eggs help to create this very creamy and light texture. It may sound silly, but when I made this cake the first time, it was like a meditation. I won’t deny, this is definitely not an easy cake. It requires time and dedication. But if you are willing to give it a shot, you will just need to take one step at a time. Don’t rush anything, just check off the instructions one item at a time. And then you will get this creamy and silky cheesecake. Japanese style and maybe drink a cup of tea with it. And relax a little. Be sure to have the eggs at room temperature. The quickest way is to put them in warm water for a few minutes. Prepare your spingform carefully and make sure it is deep enough. This cake rises a lot, I used extra parchment paper for the sides. Don’t substitute. You won’t get the same result. Be patient and don’t rush anything. Especially when waiting for the cake to cool off. If you keep these things in mind, you will have a feather greeting from Japan. Prepare a deep springform of 24-26cm in diameter by placing parchment paper on the bottom and all around the sides. Be sure that it does not leak. I usually cover the outside with aluminum foil. Sift flour and cornstarch in a small bowl twice and set aside. Separate the egg yolks from the egg whites. Be sure to keep the egg whites in a grease-free bowl. Leave both at room temperature. Prepare a double-boiler and place cream cheese, butter, butter, heavy cream and 60 grams of sugar in second bowl. Heat at medium heat while stirring. Remove from heat. Whisk in egg yolks, one at a time until well blended. Then add lemon juice and lemon zest. Sift flour and corn on top and whisk until well blended. Set aside. Preheat the oven to about 180 degrees Celsius with a deep-dish baking sheet. Pour water in the baking sheet about two centimeters high. Then whip up egg whites with a mixer on medium speed. Add a pinch of salt once you started and beat until foamy. Usually takes only a few minutes. Gradually add 100 grams of sugar while beating on high speed. 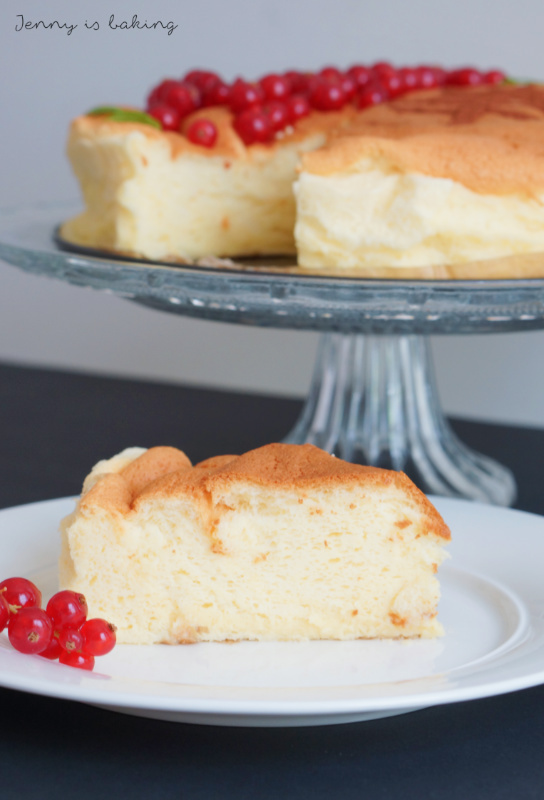 Unlike meringue, for Japanese cheesecake the egg whites only need to have medium peaks. This means that if you take out the mixer, marks should be seen and some meringue clinging to the mixer whisks for a few seconds, but then flop over. Now it's all about being gentle and only using a whisk. First add one third of the meringue to the cream cheese mix. Try not to take out air, folding by making the movement of the number 8. The add the second third and lastly the third. You should have a silky batter, light in texture and easy to pour. Pour into prepared springform, tap a few times to take out air bubbles and place in oven with baking sheet filled with water. Reduce oven temperature to 160 degrees and bake for about 70-75 minutes. Be sure not to open the oven door during this time. Reduce temperature to 150 degrees and bake 10 more minutes, then turn off oven. Put a wooden spoon or something similar in the oven door and let cake cool this way still inside the oven for about 15 to 20 minutes. If you take the cake out too quickly, it will shrink much more than desired. Now take out of the oven and let cool. Cake will shrink (this is normal). Take out springform once fully cooled and decorate to your liking. I sifted cocoa powder on top and added some mint leaves and red currants. This cake freezes beautifully. I recommend freezing prepared slices. 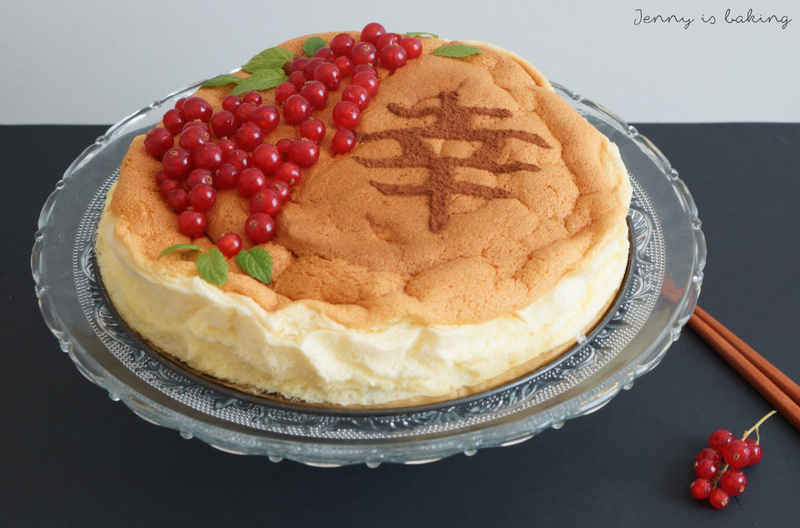 PS: The Japanese symbol you see on my cake says happiness and joy. 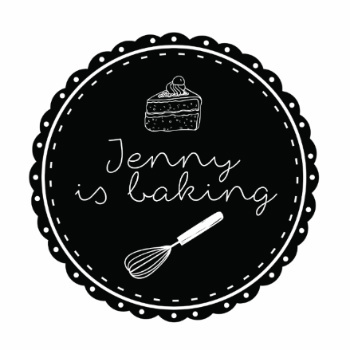 I hope that preparing, baking, and eating this cake will add some joy to your life!